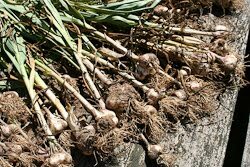 I harvested my ‘German White’ hard-neck garlic on Saturday. I created a new 16 ft. X 4 ft. bed last fall and planted 4 rows of 55 cloves each last November. My investment was 10 lbs. of garlic ($50) for planting, 4 bags of compost ($16) and some fertilizer ($3)- a total of $69. I don’t put a $ value on my gardening time- it’s a gift to myself, my family and friends. I harvested 205 solid bulbs (about 45 lbs.) and discarded about 15 bulbs that were way small or rotted.I would have to pay about $200 to buy that much good, fresh garlic at a farmers market and about $135 to buy much lower quality garlic from a supermarket. I also harvested garlic greens and scapes from April through June that would have cost another $20.And with the garlic out of the ground I’m ready to come back with a double row of bush beans that I’ll put in the freezer. 1) It seems that your planting distance was about 3.5″ apart (55 cloves in 16 ft). If you'd used the square foot garden method instead rows separated by 1 foot, how many cloves would you plant in a 1 foot square? 2) Where did you preserve the garlic you harvested after it dried? I've not planted garlic because when I store a few bulbs from the farmer's market in a dark cupboard, they sprout within a week. Any recommendations? I too harvested garlic recently, the first I've ever grown. I dried them for a few days on the floor of the garage, then wove the tops like a braid and hung to dry further. Do you think I will be OK? Lena- 1)I would plant the cloves 4 inches apart in each direction. 2)After drying my garlic I store it in my basement where it is about 68 degrees F. and the humdiity is fairly high. I bring 5-10 bulbs at a time to my kitchen. Dave- Yes, it should store just fine. You probably grew soft-neck garlic if you were able to braid it. When is the garlic you've harvested ready to eat? I would also Like to know when you can eat garlic after youv've harvested it?